The application of prescribed fire is one of the most effective yet challenging habitat management tools. It requires a specialized skill set, is weather and site condition dependent, and is expensive to implement. 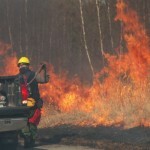 In the past decade, prescribed fire has been used primarily to treat ~100 acres of fire dependent pine barrens habitat. Periodic mowing maintains this critical habitat and mowing frequency determines, in large part, the dominant species. Often modest stands of shrubs and/or trees are retained to provide wildlife shelter and nesting habitat. 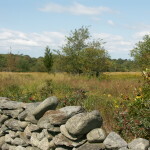 Approximately 70 acres of grassland are currently being maintained on NBNERR properties. The all-volunteer NBNERR Woodcutting Stewards Program is designed each year to achieve a specific management goal through either clear cutting or selective cutting. 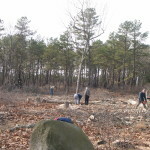 To date, woodcutting stewards have created open grassland, enhanced under story vegetation, promoted the regeneration of pitch pine, and removed non-native tree species. Click here to learn more. 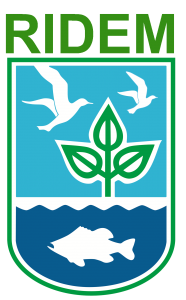 Reserve properties are heavily impacted by numerous invasive species resulting in altered habitat structure and function. Limited resources (i.e. staff, funds) prevent wide-spread control and restrict focused effort to a limited number of target species. The control of autumn olive is conducted primarily through organized volunteer effort. Many habitat types on Reserve properties require on-going maintenance to promote biodiversity and protect species of greatest conservation need. Maintenance tools and frequency of management actions varies by habitat and, in many instances, requires external resources in the form of expertise, equipment use and/or funding support. Click locations on map above to view detail regarding NBNERR habitat maintenance / restoration activities.